http://www.engvid.com/ Eating in a restaurant can be a fun thing to do with friends, but if you are just learning English all the new words can be confusing. Watch and learn what an "appetizer" is and how to change your "order", and before you know it you will be "fine dining" with the best of them. 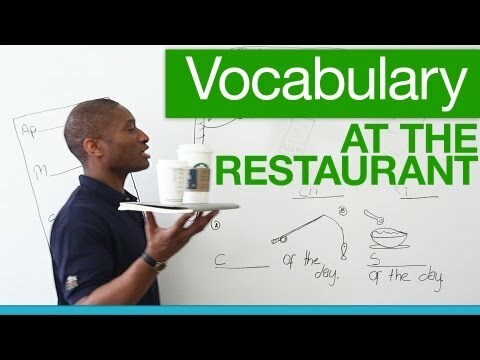 Take the quiz for this lesson here: http://www.engvid.com/basic-english-vocabulary-restaurants/ TRANSCRIPT Party of two, your table is ready, party of two. Okay, and these are your drinks, sir. There you go. Enjoy your meal. Bon appétit! Hi. James, from EngVid. When I'm not making videos, I need to make money, and this lesson, actually, is about restaurants. I used to be a waiter when I was younger, so I've been in many a restaurant, and I know it might be difficult for you when you -- I mean, you're coming to a new country. I'll slow it down for you because this is basic. You're coming to a new country, and you want to enjoy something. You want to have a meal out of your house. You know -- meal, dinner, or lunch or breakfast. And you go to the restaurant and then somebody walks up to you with, "party of", "table of", "And what would you like for appetizers?" "Would you like an app?" "Would you like this?" "Well, how about your main?" "What about this?" No! Please, don't. So let's slow it down. Let's make it basic, so when you enter a restaurant, you can right away know what they're talking about. Now, there're other things -- you know, we don't have everything in here. There are two other videos on restaurants that you can go watch on EngVid, but this is basic. But even if you think, "Oh, I know all this stuff. I'm very good", you might learn a thing or two. Okay? So come watch. So let's start off first. The worm has a drink. One of the first things they're going to come up to you depending -- and see, I don't know if you know this. There's "fine dining", "casual dining", and "fast food". First thing you should know, so where are you going? "Fast food" is like McDonald's, Taco Bell -- [coughs] that's not food -- Taco Bell, Subway -- most of this won't apply, okay? But some of these words, like -- well, we'll get there -- will apply, and I'll let you know. "Casual dining" is like Chili's or Montana's. I mean these are restaurants in the United States and Canada, so don't worry, but it's all similar. It means you can wear something like I'm wearing: jeans -- there you go. I'm getting old. Can't lift that leg up -- or a T-shirt, and it's okay. No one's going to complain, okay? And you can sit down. Not like McDonald's. You can sit down with a knife and fork, and you can eat your dinner. Or -- then you have "fine dining". "Fine dining" is when the people wear what we call "penguin suits". They have a tie and a shirt, and they walk up, and they serve on tables. Okay? But you need a reservation, and it's mucho dinero mis amigos, mucho, mucho dinero. For the rest of you, it's lots of money. "Fine dining" -- "fine" means "expensive", and you usually require a reservation to get a table. So let's just go with casual, because casual is where most can go. Even if you're in a foreign country and there are people who serve tourists, they're going to go mostly to casual, not necessarily fine dining, so I'm sticking with casual, all right? So casual -- McDonald's we know you just walk in. And here's something -- and McDonald people you can thank me. Next time you go, don't watch them and say, "Give me Big Mac. Give me French fries. And that I want." Try to say, "may I" or "can I have". People who work in the service industry -- which is what the restaurant industry is, where they serve you -- they want a little politeness, so try "can I have" and "may I have". You'll be surprised at how much better they serve you or treat you. Now let's go to the board with the worm, who is providing drinks. One of the first things you come in and you come to a restaurant, they might say to you, "party of" or "table for". And you're going to say, "What?" Well, "party of" -- I know you're not like, "Fiesta time, baby! Yeah, we're going to party, going to be drinking" -- no. What they mean is you are a group of people, and how many are in the group. So "party of two" or "party of four" means there are two -- you can say, "There are two in my party" or four. "There are two of us", or "there are four of us", or ten, okay? Then it's a "partay". It's not a "party"; it's a "partay". Now, "table of" means the same thing, or "table for", "table for". And they mean, for -- I did a video where I talked about "for" means "receive". Go look at it. "For" means "to receive", so "table for four people", so "table for four", "table for five" -- this is four. How many people? That's easy. And that's when they're sitting in the front. That's the first thing they will ask you. Then they will bring you to your table. And they're going to give you something called a "menu".